Former Prime Minister Ranil Wickremesinghe said he is willing to work with President Maithripala Sirisena, who abruptly sacked him on October 26, if given a chance to prove his majority in Parliament. Caught in an unprecedented power struggle, Mr. Wickremesinghe is trying to claim legitimacy as the country’s premier, after Mr. Sirisena appointed former President Mahinda Rajapaksa in his place and subsequently prorogued Parliament until November 16. The bitter relationship between Mr. Sirisena and Mr. Wickremesinghe appears to have further deteriorated this week, with the President resorting to personal attacks on him at a recent public meeting. On whether he could still work with the President, Mr. Wickremesinghe said: “I’ll have no problem working with him, that’s a question you must ask him. The Constitution doesn’t make provision for personal prejudices,” he said on Tuesday, in an interview to The Hindu at Temple Trees, the official residence of the Prime Minister. Deposed over 10 days ago, Mr. Wickremesinghe has steadfastly remained here, despite open threats from Mr. Rajapaksa’s supporters demanding he vacate and a sharp reduction of his security detail. On Tuesday evening, the premises was teeming with people, mostly supporters of Mr. Wickremesinghe. They waited around different entry points to the iconic Colonial-era building to catch a glimpse of their 69-year-old leader, who has been in Parliament for over four decades. Constant chants of the ‘pirith’, which Buddhists believe will keep evil and misfortune away, filled the air. They emanated from a white pandal erected right outside the main entrance. Two monks in saffron robes were seated inside and chanting into a microphone. “We have had this chant non-stop for 10 days now,” a security staff said. 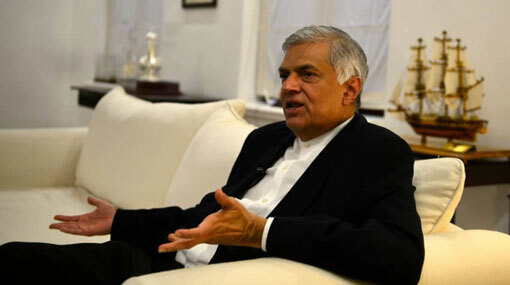 Amid the persisting political crisis Mr. Wickremesinghe is optimistic about an early recall of Parliament. “The Parliament’s power is supreme and that is what the Speaker has upheld,” he said, referring to Speaker Karu Jayasuriya’s statement on Monday, noting that Mr. Rajapaksa will not be recognised as PM until he wins a floor test. “I am confident of having the numbers,” Mr. Wickremesinghe said, adding: “The fact that they are delaying the recall is because they don’t have the numbers.” President Sirisena, who earlier suspended Parliament until November 16, has recalled the House for November 14. “The delay worries me because it makes the country more unstable,” the ousted PM said.